Friends of Palestine WA has called a speakout this Friday to support the BDS (boycott, divestment & sanctions against Apartheid Israel) campaigners who were arrested in dawn raids on August 9 in Melbourne. The speakout will also be taking up threats by the Victorian government to use trade practices law against the BDS movement. This has implications for all progressive campaigners and is a major free speech issue. The speakout will be in the Murray Street Mall outside the Perth Underground Station from 4:30pm on Friday 12 August. Join the protest for free speech and a free Palestine. 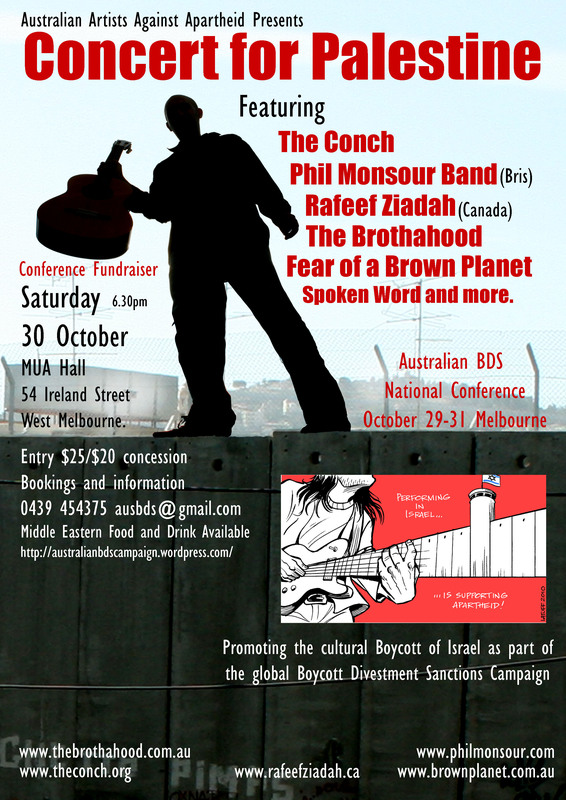 The speakout will also be promoting the Boycott Apartheid Israel rally in Perth on September 17. The BDS (Boycott, Sanctions and Divestments campaign) is an international campaign to put pressure on Israel’s racist, Apartheid policies until it complies with international law and stops violating Palestinian human rights through the illegal occupation of Palestinian land. The BDS campaign is modeled on the successful campaign which culminated in the dismantling of South African Apartheid. Australians, in the tradition of non-violence, were active in that campaign. BDS targets businesses that contribute to, or profit from, Israel’s violent military occupation of Palestinian land in the West Bank and Gaza. Some BDS targets are Israeli owned, such as Max Brenner and Seacret Cosmetics (which mines the Dead Sea within occupied Palestine). Some BDS targets are international, such as Caterpillar (who produce special equipment to destroy Palestinian homes and agriculture) and Veolia transport and waste management (who are building railways on stolen Palestinian land, for exclusive Israeli use). On July 5, at a BDS protest outside a Max Brenner shop in Melbourne, 19 peace activists were arrested. They thought consumers should be aware that this corporation directly funds Israeli military units which stand accused of War Crimes against Palestinian civilians. On August 8, during dawn raids, 4 of these activists were re-arrested, accused of violating bail conditions by attending another protest. Meanwhile the Victorian Government is trying to use anti-union “secondary boycott” laws to silence dissent against Israel’s appalling record. 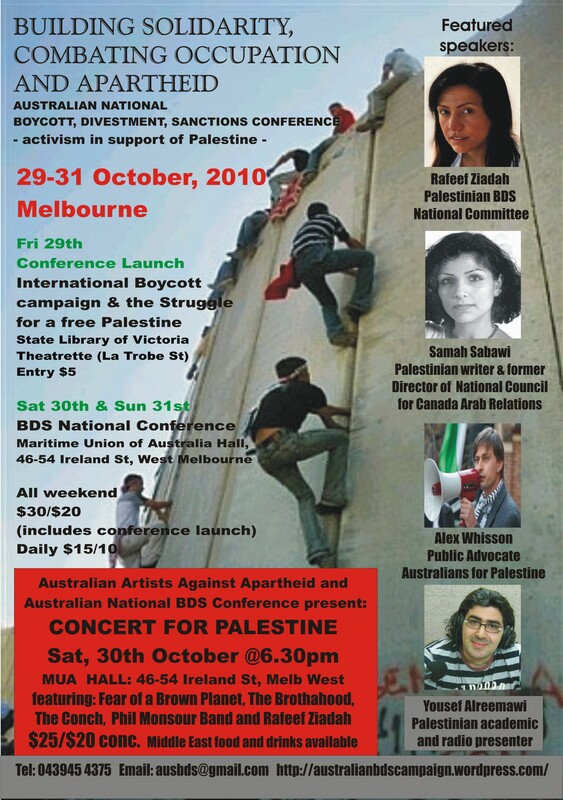 Friends of Palestine WA stands in solidarity with the BDS campaigners who were arrested in Melbourne. Why are Australian politicians shielding Israel, and criticising human rights activists? Why do Palestinian human rights get ignored, while Australian military trade with Israel continues? Why shouldn’t consumers know what corporations do with their profits? Protest, consumer information and boycotts are integral to a democratic society! For more information on BDS see www.bdsmovement.net. Stand up for Palestinian human rights! Stand up for civil rights in Victoria! Oppose the criminalisation of protests in support of Palestine! On 1 July 2011, the Victorian police viciously attacked a peaceful pro-Palestine demonstration in Melbourne’s CBD. In one of the largest political arrests in a decade, 19 non-violent protesters were arrested during a Boycott, Divestment and Sanctions (BDS) action against Israeli-owned Max Brenner store. The chocolateria in the Queen Victoria Centre is owned by the Israeli conglomerate ‘Strauss group’; a company that provides “care rations” for the Israeli military, including the Golani and the Givati brigades – two of the key Israeli military brigades involved in Israel’s brutal assault on Gaza in December 2008/January 2009, which killed more than 1300 Palestinians, the majority of whom were civilian, including over 300 children. The peaceful picket was ‘kettled’ by police before leading activists were individually targeted in an unprovoked attack by the police riot squad. The tactic of completely surrounding a group of protesters is called “kettling”. The majority of those arrested have been charged with “trespass” and “besetting”, while a small number of the demonstrators were also charged with “behaving in a riotous manner”. Video taken of the demonstrations shows that the pro-Palestinian activists were completely peaceful and they were attacked in a violent and unprovoked manner by the Victorian police. The protest against Max Brenner occurred as part of the global Boycott Divestment and Sanctions (BDS) campaign against the apartheid Israeli state. Inspired by the South African struggle against apartheid, the BDSanctions campaign was launched by Palestinian civil society in 2005. Endorsed by more than 171 Palestinian civil society organisations, including political parties, women’s groups, trade unions, associations, the BDS campaign is conducted in the framework of international solidarity and resistance to injustice and oppression and calls for non-violent punitive measures to be maintained until Israel meets its obligation to recognise the Palestinian people’s inalienable right to self-determination and fully complies with international law. The attack on the peaceful BDS action in Melbourne highlights increasing attempts to criminalise BDS and pro-Palestine solidarity activism internationally. Currently in the US, France and Greece, hundreds of pro-Palestine activists are facing criminal charges for non-violently standing up for Palestinian human rights. The attack also highlights the attacks on civil liberties, freedom of speech and freedom of assembly in Victoria by the Baillieu government. In June 2011, Bailleu’s Coalition government introduced new laws extending police powers, allowing the Victorian police to issue on-the-spot fines of up to $240 for using “offensive” language. The new laws do not define clearly what “offensive” language is, allowing individual police officers to arbitrarily decide what is offensive or not. The government has also established a new 42 member “Public Order Response Team”. According to the Melbourne’s Herald Sun newspaper, one of the primary functions of Baillieu’s new riot squad will be “breaking up public protests”. We call on all supporters of human rights, freedom of speech and civil liberties to stand in solidarity with the 19 BDS/pro-Palestine activists who were beaten and arrested by the Victorian police on July 1. Support and/or join the “Boycott-Israel19″ Defence campaign today!